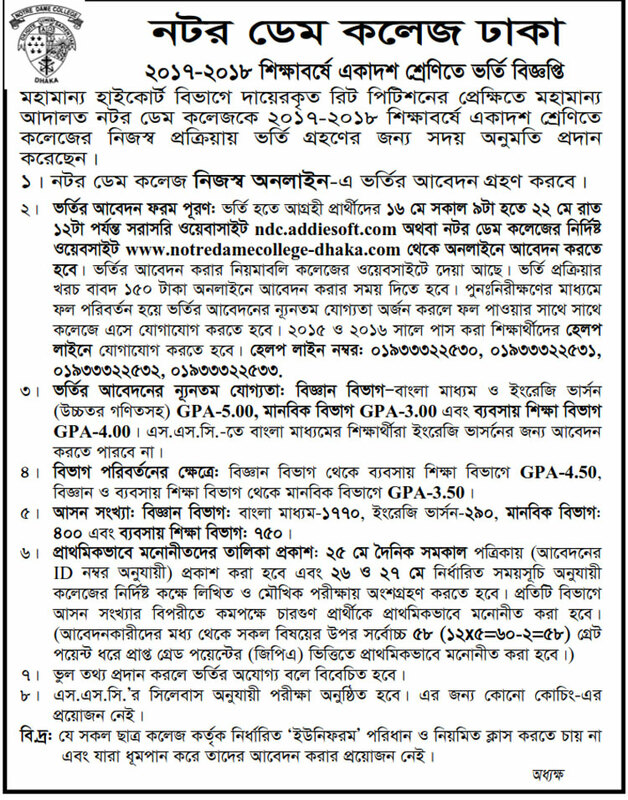 Notre Dame College HSC Admission Result 2017 | www.notredamecollege-dhaka.com. Notre Dame College HSC Admission Notice 2016 and result will be found here. Notre Dame College HSC Admission 2016 procedure will be started within a short time. According to “HSC Admission Curriculum 2016″ there will not be taken any admission test (Neither written test nor viva voce) and GPA will be the only parameter for admission in colleges. But Notre Dame College will not follow this rule rather they will enforce their own procedure for HSC admission like previous years. Total Seats Available in Notre Dame College: 3,100. Notre Dame College will follow the digital system. Notre Dame College HSC Admission Procedure is composed of application form fill up and submission, primary selection, written and viva exam and final selection. Notre Dame College will primarily select approximately two/three times more students in proportion to the seat number. The primary selection will be made on the basis of GPA. Those who will get maximum grade point out of GPA 58 Grade (12X5=60-2=58) will be selected primarily. The primary Selected candidates will be called for written and viva exam. There is no specific syllabus. Notre Dame College will take written and viva exam on the basis of SSC curriculum. Those who pass the written and viva exam will be finally selected for HSC Admission in Notre Dame College. Like Our Facebook Fanpage facebook.com/resultnotice to get the latest news of Notre Dame College HSC Admission Result 2017 and get future updates. This entry was posted in Admission Notice, College Admission, HSC Admission, Notice and tagged NDC Admission 2014, NDC Admission 2014 Circular, NDC Admission 2014 Result, Notre Dame College HSC Admission 2014, Notre Dame College HSC Admission 2014 Notice, Notre Dame College HSC Admission 2014 Result, Notre Dame College HSC Admission 2015, Notre Dame College HSC Admission Notice 2015, Notre Dame College HSC Admission Notice 2016, Notre Dame College HSC Admission Result 2015, www. notredame.ac.bd by Result Gov BD. Bookmark the permalink. It’s a good admission circular. st.Joseph er students der jonno ke kono ogradekar ace? ?